Apologies for the infrequent posts this month. June has flown by! We've been keeping ourselves busy this summer with mini trips up the coast, entertaining family & friends visiting from out of town and your average everyday toddler fun. So needless to say, the project list has been neglected... BIG TIME - and I have a sneaking suspicion the neglect will continue through the summer. I'll do my best to stay focused but to set expectations for my lovely loyal readers... I'm hoping to check in with you 1 or 2 times a week with a fun post. 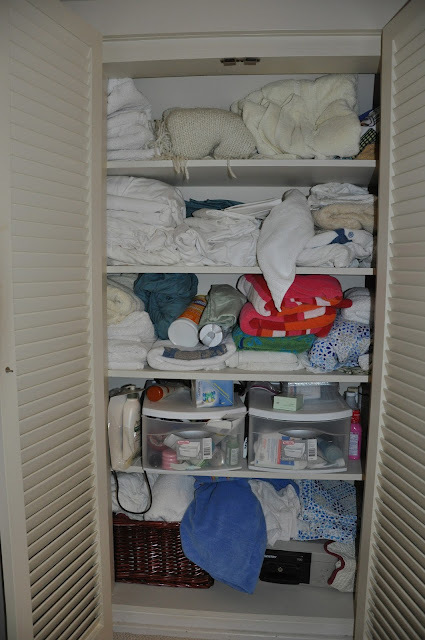 In other news, our upstairs linen closet is finally in working order. This closet was part of the master renovation and an hour of yesterday afternoon was dedicated to filling it with bed linens. 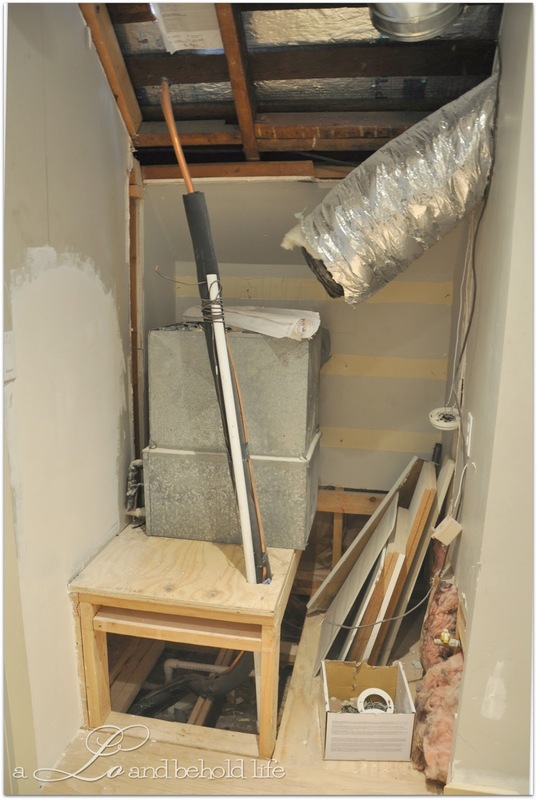 This was the linen closet pre-demolition... I'm speechless. Actually, a few words come to mind but they are not appropriate for this family friendly forum. Then this was the condition it sat in for about 2 months. There was a lot of back and forth with the Furnace Crew, our Contractor and myself. The original plan was to relocate the furnace from our master bedroom closet into this linen closet (obviously to make room for my shoe collection) and still work in some storage space for our bed linens. The Furnace Crew said it wasn't possible. But I found if you ask your Contractor the same question over and over and over again to the point of exhaustion you will eventually get the answer you were hoping for. See! I told them it was possible. 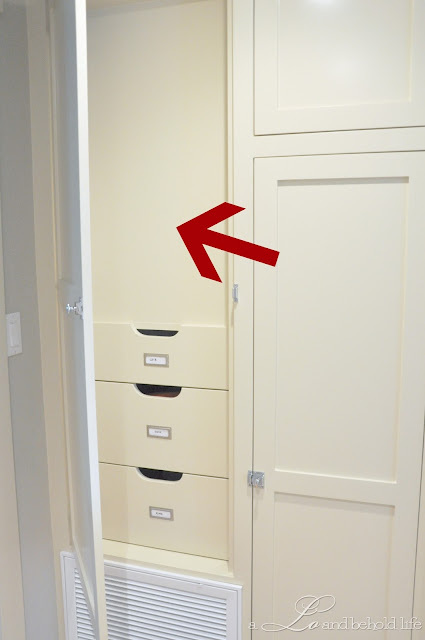 They should know never to mess with a woman and her closet space. I mean please... really!! 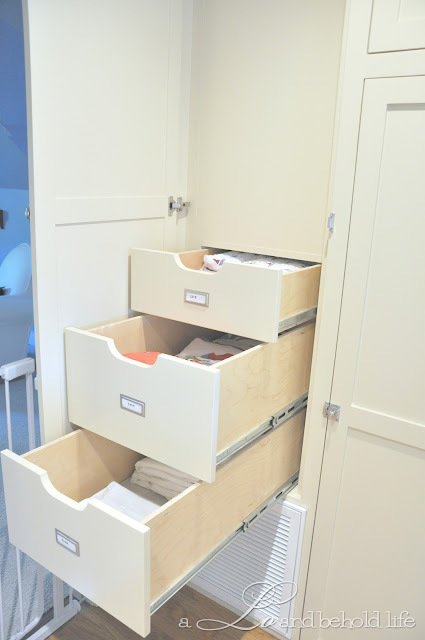 The drawers are about 27 inches long so the amount of storage is pretty great. 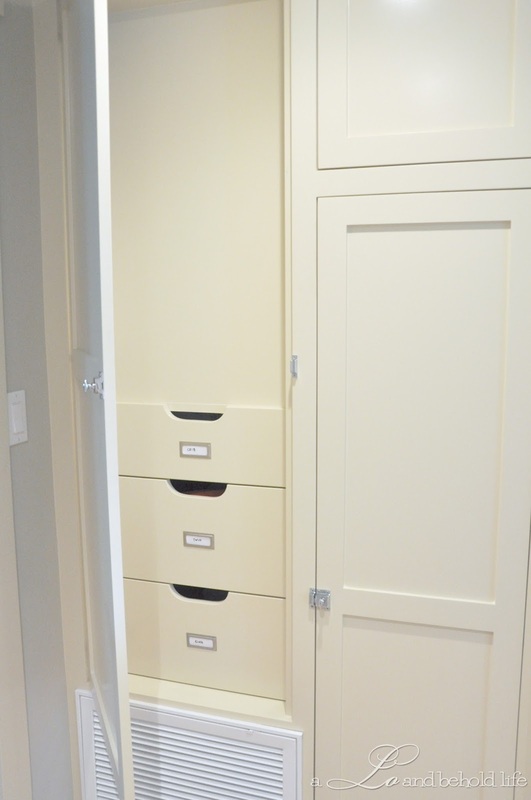 I lined all the three drawers with Kaufman Waterford Linen fabric from fabric.com and labelled them with Martha Stewart's Adhesive Bookplates. 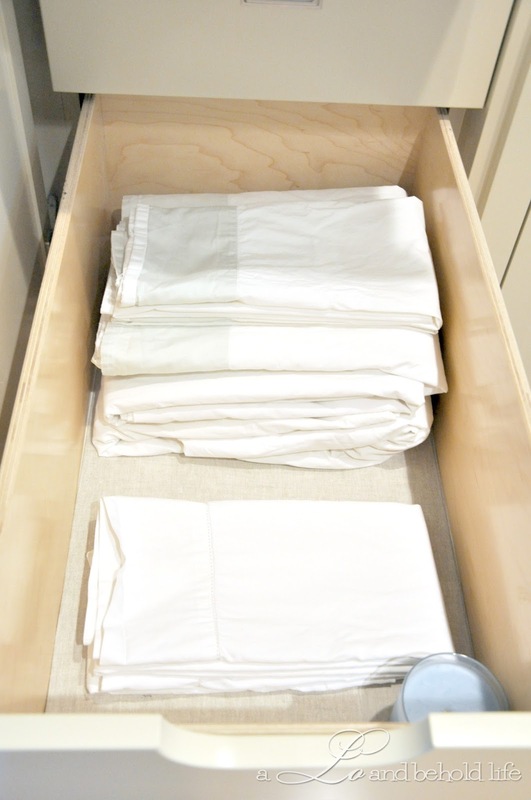 The boys are still using crib sheets for their toddler beds but the future plan is to use this drawer for extra bathroom toiletries and supplies when they convert to real big boy beds this Fall. 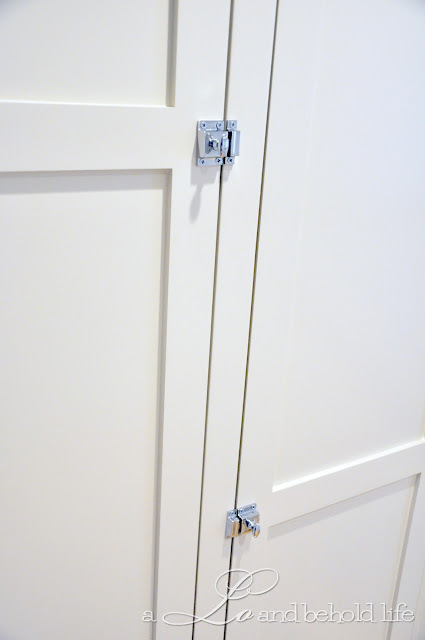 The door hardware are the Utility Latches from Restoration Hardware. 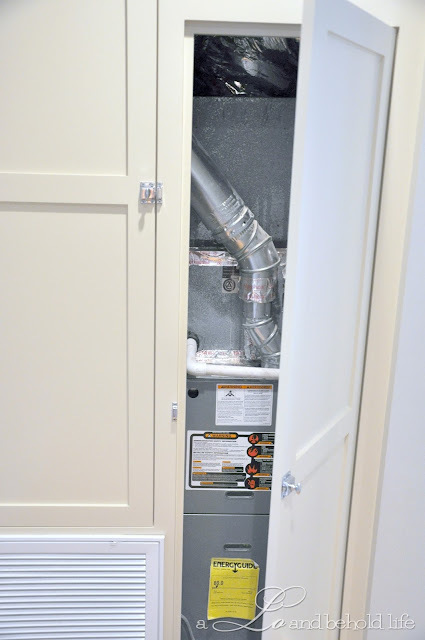 And the furnace hides neatly and safely behind the latched door on the right. Any suggestions for how to make that dead space functional? Why did the lobster tell the crab "You can't play my game!" Cuz the lobster was shellfish! It's no secret that I am a New England Girl at heart living on the west coast. Right around this time of year is when I miss the "short" 2 1/2 hour ride through Boston and over the Sagamore Bridge to Cape Cod. Even better, add a short Flying Cloud ferry ride to one of my favorite places on this planet... Nantucket! I'm drawn to anything and everything that reminds me of the charming coastal living style of the East Coast. So when I happened upon these guys in Homegoods yesterday I quickly captured them (could I BE more cheesy?!) Not bad for $16.99 a piece. 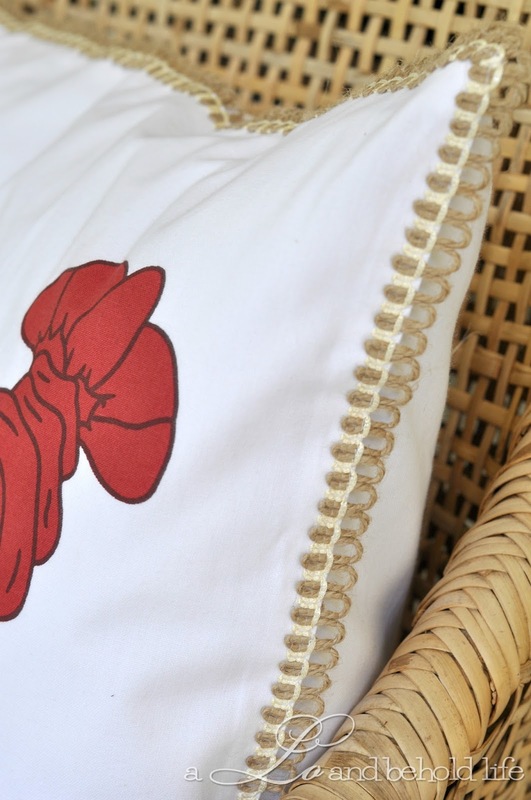 The burlap detail for the trim is so sweet. And since I was out front taking pictures, I thought I'd share some progress on the flower box. Look what I have not killed yet managed to keep alive! I'm sure it's only a matter of time... one lazy weekend of no watering and these flowers will be toast! This picture reminds me that it's time to put the Father's Day flag out... and buy a Father's Day gift and maybe plan some sort of cookout. It's not quite Nantucket, but I'm looking forward to spending some warm evenings with my fav guy on our fav porch this Summer. Today I'm doing something a little different from the norm. A guest post! 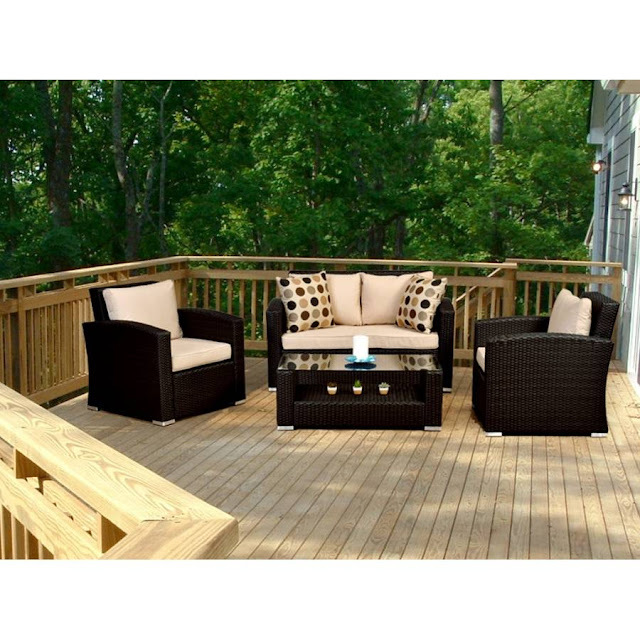 Eva reached out to me a while back and offered to contribute some inspiring ideas for outdoor living spaces. 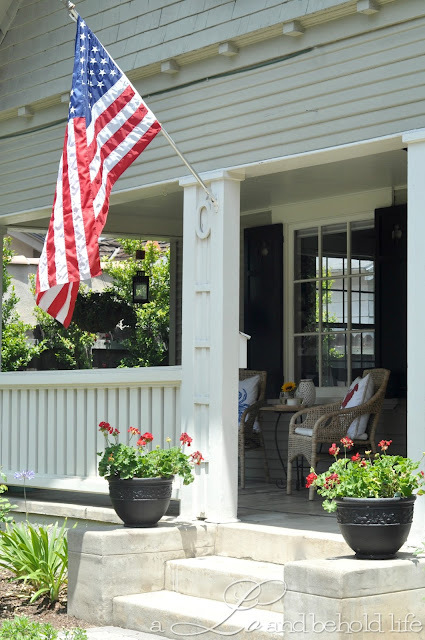 She's a passionate blogger and design enthusiast who likes to write about home styling, decorating, organization, DIY how to's and anything pretty much about home. You're speakin' my language, Eva! Hi all. I am Eva Stephen and many thanks for Lo who introduced me with her readers. 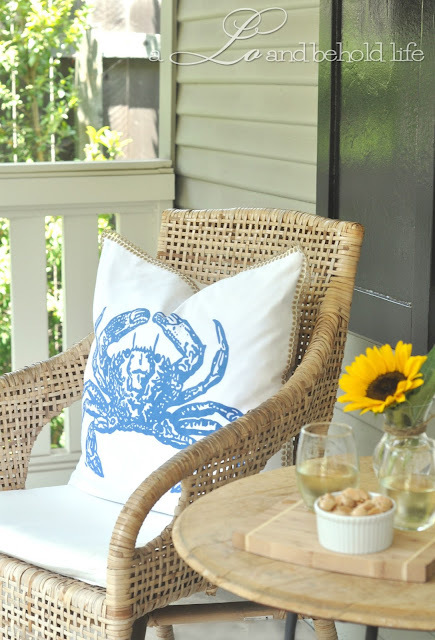 I have some thoughts for outdoor decor as summer evenings are celebrated for bbq's and snacks + tea parties. Hope you like. 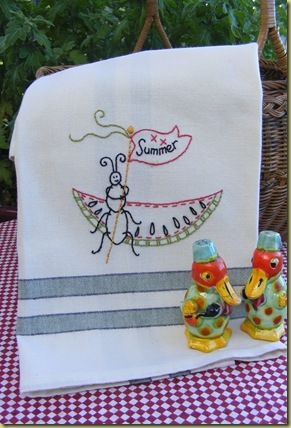 Enjoy the summer season. 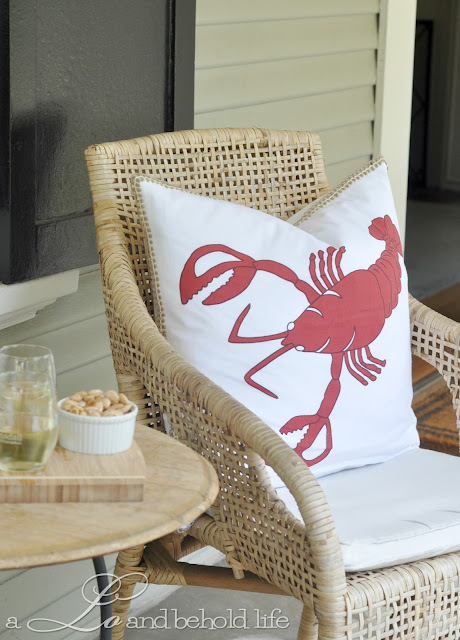 No longer is decor confined to the inside of the house; nowadays there are an abundance of products and ideas that are specifically designed for outdoor use. Easy-to-install decking makes it a doddle for almost everyone to have a fabulous outdoor area that can be beautifully offset with garden furniture, a chiminea for those chilly evenings and even decorations to enhance the whole effect. Even the most beautiful gemstone loses some of its allure when placed in a grimy, ill-proportioned setting, and it is the same with outdoor decor! Trim the lawn and pull out any large and ugly weeds, not forgetting to tidy up the edges by the fence and garden bed borders that are sometimes overlooked. 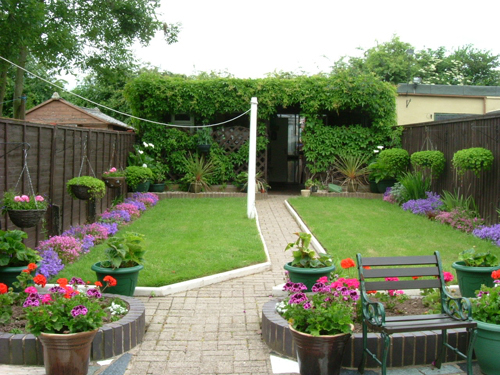 Once the lawn is looking good, and your bedding plants are on display give the patio or decking a good scrub, especially if it hasn't been used since last summer. Protective varnishes and treatments can spruce up tired or weathered looking wood and restore it to a natural warm shade. No-one likes to feel cramped and constrained, especially when outside, catching some sun and feeling the pleasant breeze. Close proximity to others can ruin the whole 'al fresco' vibe and cause tension in the party. 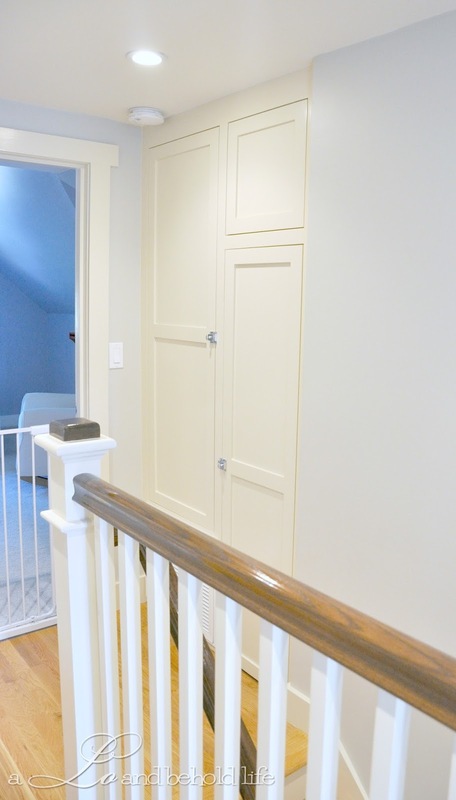 Lay the furniture out generously, giving every piece a decent amount of space, and rather leave out one piece of furniture rather than squeeze the entire set into too small a space. Rather than a large table up to which the chairs are drawn, invest in a lower level coffee table – perhaps even pinch the old one from the living room, and treat yourself to a stylish new one from shop4furniture.net. This will enable you to spread out the furniture in a more casual and friendly manner. A tall elegant chiminea add a touch of class to an outdoor area, and also provides a point of focus around which furniture can be placed as an alternative to the table. The chiminea also provides welcome warmth after a leisurely day in the sun, as the evening draws in and it begins to get a little chilly, yet everyone is enjoying the day too much to want to go in! 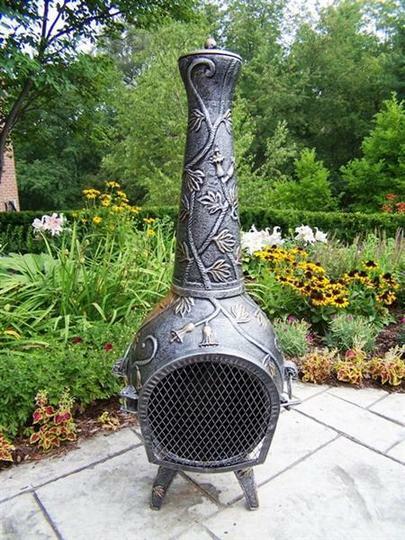 Must have a look at the chiminea range at Garden Incinerator for a good variety. Vibrantly coloured windmills to catch the gentle breeze, sparkly sun-catchers that twinkle and gleam in the sun and soft wind chimes that resonate all enhance the out-door experience. Bright and cheerful colours appeal to everyone and make us all feel happier and more relaxed. Rather than setting out a host of small tables or having to resort to the large unyielding central table scenario make use of innovative features – old barrels standing on one end make wonderful flat surfaces on which to rest drinks, snack bowls or even lamps or lights and add rustic charm to the scene. Miniature greenhouses can serve as shelving while bringing green and leafy touches to the patio area. There is not much call for soft furnishings outside, but comfortable chair cushions, handy tea towels and aprons and perhaps even a rough floor covering can all be made from waterproof fabrics. These can add a tremendous burst of summer fun to your outdoor seating with sizzling summer colours! A little investment of time and money can give you the outdoor dining area that you have always wanted. Sure to be a smash hit with family members and friends alike, you will soon find that your barbecues are the most hotly anticipated events of the summer in your neighbourhood! 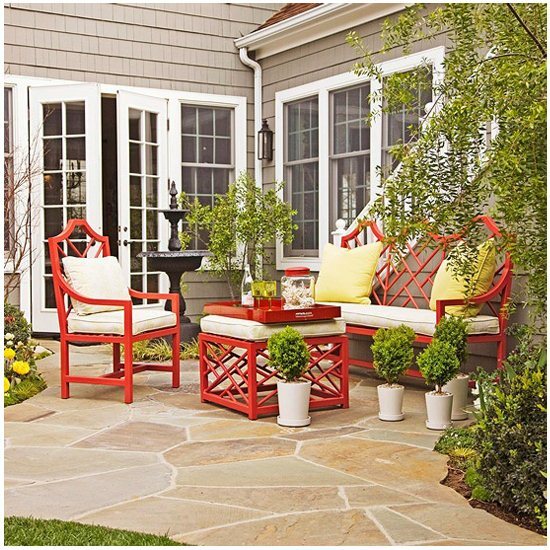 Great inspiring ideas, Eva, and perfect timing for everyone who's getting their outdoor living space ready for summer. 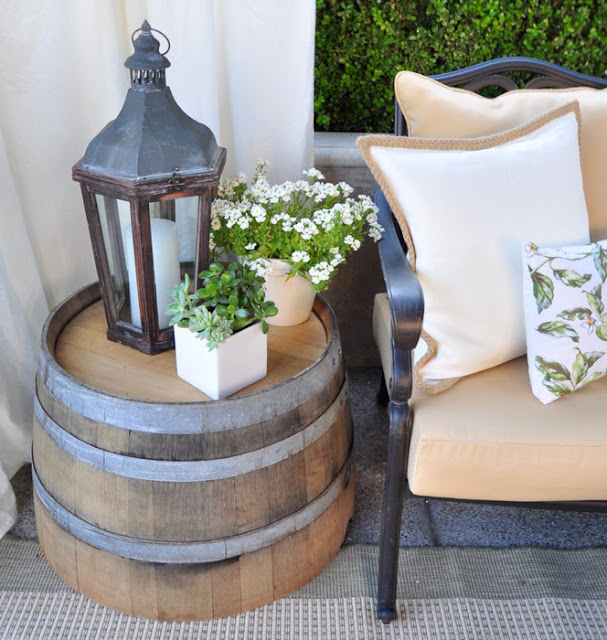 I'm totally digging that wine barrel end table!